Taken by Cowboy Geoff, and copyright 2006. Every time I spent time with Pappaw, we’d take a break around 10:00 or 10:30 am and walk down to the store and have “Mountain Dew” time. This was back in the day soda was bottled in glass bottles and the Mountain Dew brand had a bottle with a little hill billy on it (I can use that term, since I am one), with a picture of the cork flying through the little guy’s hat. The motto “It’ll Tickle Your Innards” was emblazoned upon the bottle. We’d pick our dope and go find a bottle opener and stand around the cashier’s counter swapping tales as we refreshed ourselves. The workers at that store were like an extension of the family. They always seemed to welcome our company as we took our Mountain Dew breaks. We’d usually come back around 3 p.m. and do it all again. 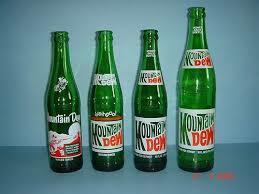 Time passed and the bottlers changed how they bottled our favorite soda, so my Pappaw talked with the delivery truck driver one day and found out he could get Mountain Dew delivered to his house in glass bottles that were smaller and not labeled for resale. We would get a couple cases of it, and one of Pepsi for Mammaw. We were living like kings. Now the sugar content wasn’t good for us, and we would have done better with water, but it was the time spent with Pappaw when he took his breaks and cleaned the tobacco out of his mouth, and brought out a bottle of “Good ole Mountain Dew” to share that made my time with him really special. Usually he’d commence talking about something, sharing a story of his work experience at the Kingsport Press, or a family history tale from a previous age. This time was every bit as important as the time I spent in formal learning at the schoolhouse. “Dope time,” as he called it, would usually always bring out at least one good tale. Sometimes I had already heard the tale, but it was good to hear it a second time and listen for nuances of differences in whatever version he was telling. I’ll never forget the time he told me that about the time I was born he had a dream that he had died and gone to heaven. He said it was a place so beautiful he couldn’t describe it. But he was told he had to go back, because his job on earth wasn’t over. They didn’t tell him what his job was, but he would look at me and and take a sip of Mountain Dew, and smile. He was truly placed in my life as a blessing. And Mountain Dew Time was our best time of the day. What a great memory Brad. Your grandfather was a wise man full of love. We had a little store near my house in Atlanta and I have great memories there getting coke and collecting pop bottles and buying the latest baseball cards.